Explore the breakdown of the universal family form into new living arrangements and the political and social implications of how they influence the definition of family today! 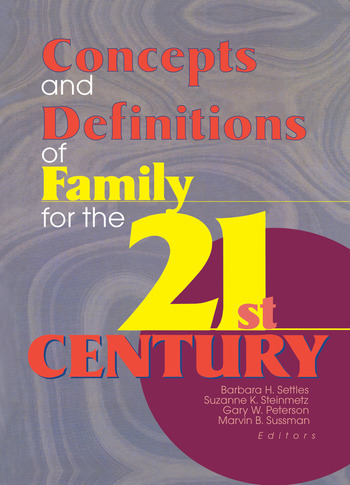 Concepts and Definitions of Family for the 21st Century views families from a US perspective and from many different cultures and societies. You will examine the family as it has evolved from the 1950s traditional family to today’s family structures. The controversial question, “What is family?” is thoroughly examined as it has become an increasingly important social policy concern because of the recent change in the traditional family. Scholars and researchers in family studies and sociology will be intrigued by these thought-provoking articles that analyze the definition of the family from a multitude of perspectives. We Must Not Define “The Family”! What Are Families After Divorce?